Food manufacturing company Symington’s Australia has launched three new Chicken Tonight simmer sauces and refreshed labelling across the entire range of 15 flavours, as part of its strategy to reinvigorate Australian sales of the simmer sauce. The new Chicken Tonight flavours are: Honey Teriyaki with carrots and soy sauce (510g), Parmigiana with Parmesan cheese & basil (490g) and Spanish Chicken with peppers, olive oil & thyme (495g). Mirroring its successful turnaround strategy in the UK, Symington’s purchased the Australian rights to the Chicken Tonight range from Unilever in 2013 and has since completed an extensive range review. Symington’s Australia is a subsidiary of UK-based Symington’s Ltd, one of the UK’s long established food companies. Established in 1827, Symington’s currently produces a wide range of products under its own brands, under licence and for private label customers. The Company is a leading player in the food categories within which it competes, with a portfolio of brands including Ragu, Chicken Tonight, Campbell’s, Ainsley Harriott, and Aunt Bessie’s in the UK, and Chicken Tonight, Raguletto, Five Brothers, and Mug Shot in Australia. 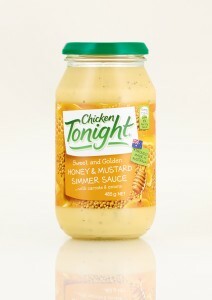 Symington’s said it has committed to further investment across the Chicken Tonight range in 2014 to increase share of the $63million simmer sauces category, including more flavour innovations and an integrated marketing campaign. “Value is important, but convenience is still king when it comes to feeding families, and Australians deserve a better range of quality choices when it comes to simmer sauces,” said Allen Hunt Symington’s Australia Marketing Manager. “Chicken Tonight is a fantastic simmer sauce, and we are introducing new flavours and refreshing the look of the range to increase appeal to modern, busy families who want great tasting meals that are easy to prepare,” he said. The Chicken Tonight range of 15 simmer sauces (RRP $3.14) are all made in Australia and available nationally from Woolworths, Coles and IGA supermarkets.